On June 30, 2016, the U.S. Department of Labor issued an Interim Final Rule to implement the Federal Civil Penalties Inflation Adjustment Improvements Act passed last Fall as part of the highly publicized “Bipartisan Budget Act of 2015” negotiated between the Republican-controlled Congress and the White House. Employers have a short window – until August 15th – to submit comments on the penalty increase rule. As described in our November 2015 article here on the OSHA Defense Report, the inclusion in the budget deal of this extraordinary provision requiring immediate penalty increases to “catch up” with inflation was shocking to many, especially in light of the fact that the Republicans who accepted it are the same politicians who, year after year, reject Democrat-led efforts to pass some version of the Protecting America’s Workers Act – OSHA reform legislation that has as its cornerstone a provision to increase OSHA statutory penalties. Although the Federal Civil Penalties Inflation Adjustment Improvements Act applies to all federal regulatory agencies, its impact will be felt most by employers receiving citations from OSHA. This is because many federal agencies, such as EPA and MSHA, quasi-regularly increase their penalties based on inflation. OSHA, on the other hand, has been statutorily prohibited from raising penalties for the last 25 years under a budget bill passed in the 1990s. As a result, OSHA’s August penalty “catch-up” hike will be the most significant of all federal agencies, raising penalties a whopping 78%, and increasing employers’ burden by an estimated $111M in the first year. Also extraordinary is the fact that the regulation was not promulgated pursuant to the normal administrative process, whereby interested stakeholders among the public have an opportunity to comment on a “Proposed Rule” before it is finalized. This rule was promulgated as an “Interim Final Rule” that, by its terms, goes into effect just one month after it was published in the Federal Register, and before the public comment period closes. This too was mandated by Congress, and is allowed under the “good cause” exemption to the Administrative Procedure Act, the law that normally requires agencies to provide the public with an opportunity to review and comment on proposed rules, and further requires them to respond to all significant comment before finalizing a rule. The Interim Final Rule process certainly begs the question of whether the public comments submitted will have any meaning whatsoever. Note that the new penalties are applicable not only to those violations alleged to have occurred after August 1st, the effective date of the new regulation, the Rule allows OSHA to fine employers at these new levels for all citations issued after August 1st, even where the alleged violation predates the Rule’s effective date. Accordingly, any violation occurring six months prior to August 1st, and cited on or after August 1st will be subject to the new higher penalties. In addition to the one-time “catch up” increase, the Interim Final Rule also requires the establishment of a process for automatic annual updates of penalties to keep pace with inflation in the future. Although Congress does not require it in the Federal Civil Penalties Inflation Adjustment Improvements Act, federal OSHA has already notified all of the nation’s numerous federal OSHA-approved state occupational safety and health regulatory programs (e.g., Cal/OSHA, NC OSHA, etc.) 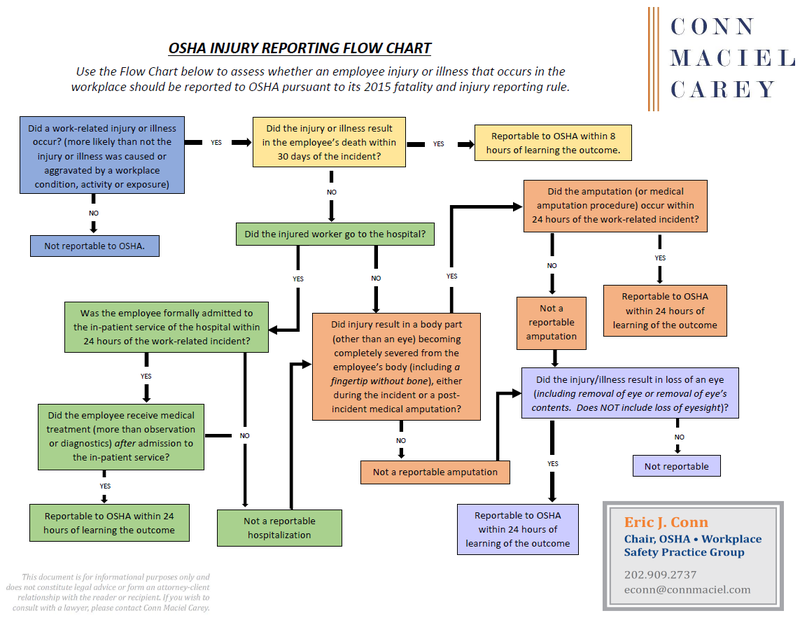 that OSHA expects the State Plan States to adopt penalty levels at least as high as federal OSHA’s new maximum penalty levels to maintain their approved status. 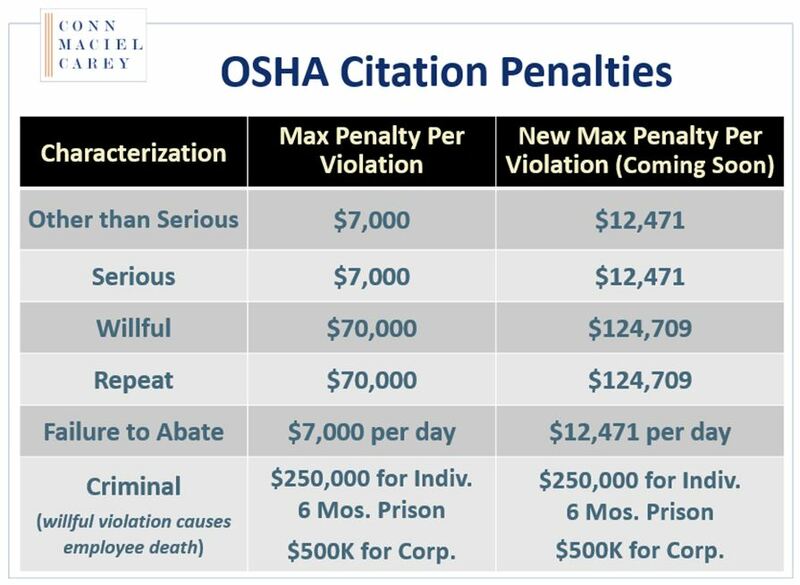 Just as importantly as the mandate that the State OSH Programs increase their maximum civil penalties, federal OSHA mandated that the States adopt fed OSHA’s penalty “policies,” such, as maximum allowable reductions for small businesses, penalty minimums, discounts for good OSHA history and good faith, etc. While it is not clear that much can be done to stop the onslaught of higher OSHA fines, it would nonetheless be beneficial for the Labor Department to hear from business owners, industry associations and others about the potentially damaging impact if OSHA overreaches with its new penalty powers, particularly as it may affect small businesses. Even though the Agency had little discretion in implementing the Congressional mandate to revise its maximum penalties, it certain retains discretion in how it applies its penalty policies, such as providing discounts and reductions based on employer-size, a history of compliance, and other factors. With these much higher penalty maximums, the Agency has much more reason to withhold using its maximum penalty authority, and industry should urge the Agency to do so.